WEST PALM BEACH, Fla. — President Donald Trump reacted to reports Saturday about the coming retirement of FBI Deputy Director Andrew McCabe, who has been buffeted by attacks from the president and his Republican allies over alleged anti-Trump bias in the agency, by repeating falsehoods about McCabe's wife. "How can FBI Deputy Director Andrew McCabe, the man in charge, along with leakin' James Comey, of the Phony Hillary Clinton investigation (including her 33,000 illegally deleted emails) be given $700,000 for wife's campaign by Clinton Puppets during investigation?" Trump tweeted. McCabe spent hours behind closed doors on Capitol Hill this week being grilled by lawmakers on two separate committees as part of a new investigation of the FBI and its 2016 inquiry into Clinton's email practices when she was secretary of state. His role supervising the email investigation has come under renewed scrutiny. But Trump's tweet is incorrect. McCabe's wife, Jill, did not get $700,000 in donations from Clinton for a Virginia state Senate race in 2015. The money came from Virginia Gov. Terry McAuliffe's political action committee and the Virginia Democratic Party and was donated before McCabe was promoted to deputy director and assumed a supervisory role in the Clinton email investigation. McAuliffe is a longtime supporter of Hillary Clinton and her husband, former President Bill Clinton. 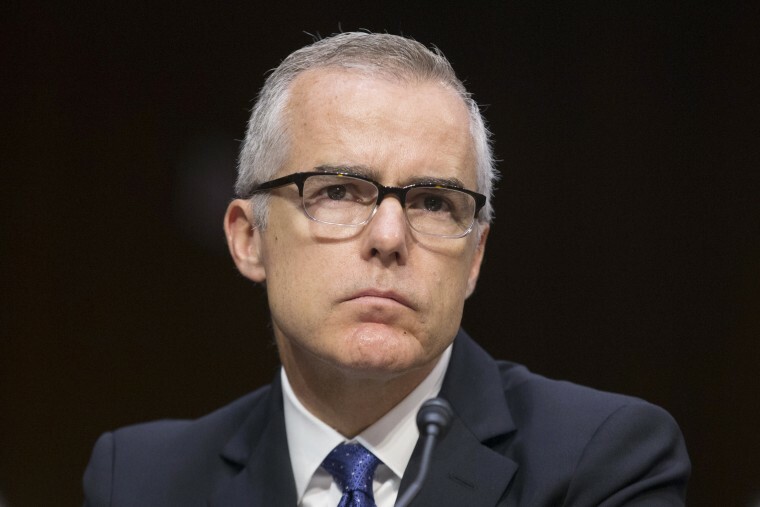 McCabe became acting FBI director in May after Trump fired James Comey, who was overseeing the bureau's investigation into Russian interference in the 2016 presidential election. Trump maintains there was no collusion between his campaign and the Russian government, and has blasted the investigation as a "witch hunt. From his South Florida home, where he is spending the holidays, Trump also tweeted that McCabe "is racing the clock to retire with full benefits. 90 days to go?!!!" In another tweet early Sunday morning, the president again assailed McCabe. Ranking member of the House Permanent Select Committee on Intelligence, Rep. Adam Schiff, D-Calif., said in a tweet that it would "set a dangerous precedent" if the FBI fired McCabe under pressure from the president. McCabe was among the candidates Trump interviewed for the FBI director's job after he dismissed Comey. He also has been a focus of Trump's ire for some time. Trump originally sent the incorrect tweet about McCabe's wife's campaign in July. In a second tweet that month, the president asked "why didn't A.G. Sessions replace Acting FBI Director Andrew McCabe, a Comey friend who was in charge of Clinton investigation," referring to Attorney General Jeff Sessions. Republicans charge that an anti-Trump bias exists in the bureau's ranks, citing the campaign donations to McCabe's wife and, more recently, the release of hundreds of text messages between FBI counterintelligence agent Peter Strzok and FBI lawyer Lisa Page. Strzok and Page used words like "idiot" and "loathsome human" to describe Trump during the campaign. Trump said earlier this week that he's not considering firing Mueller.